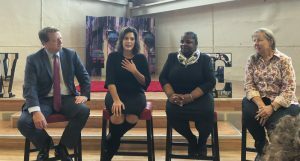 During a recent community forum on education and urban issues, gubernatorial candidate Gretchen Whitmer had no shortage of examples to show what she would seek to change if elected. Diversion of hundreds of millions of School Aid Fund dollars each year to fill gaps elsewhere in the state budget. Draining resources away from the state’s neediest communities. Retention of third graders who do not meet a standardized test benchmark. Tax cuts for corporations and new taxes on retiree pensions. All bad policies; all enacted under total Republican rule, said Whitmer. “Right now in our state we have seen the failure of the last 25 years, where we had a family on the west side of the state pretty much dictating the law and dictating funding when it comes to education,” Whitmer said, referring to the influence of the DeVos family over GOP politics. “Probably the most demoralized group of people in our state right now are educators, because they’ve been attacked and blamed and stripped of the resources they need to be successful,” she added. Whitmer was joined by panelists Aimee McKeever, president of the Pontiac Education Association; school board member and state House candidate Brenda Carter; and state Rep. Tim Greimel (D-Auburn Hills). McKeever told the crowd of community members and activists that 75 percent employee turnover in the city’s schools over the past several years can be attributed to destructive state policies that fail to value students, respect educators, and adequately fund public education. Hit hard economically by the loss of its manufacturing base, the city of Pontiac struggled for years under a succession of state emergency managers, and the school district has been slashing budgets for five years under a consent agreement with the state. “We were told either follow these mandates or there will be repercussions,” Carter said. From his very first state budget, Gov. Rick Snyder’s approach to education has been “upside-down,” Whitmer noted – giving a $1 billion tax cut to businesses while cutting school spending, taxing retiree pensions, and shrinking the earned income tax credit that allowed working families to keep more of their earnings. Education spending still has not returned to pre-Recession levels. Numerous studies and reports have found that Michigan is underfunding education, especially for poorer, at-risk, and special education students. Meanwhile, school employees have seen their take-home pay shrinking as new laws forced them to absorb increasing health care premiums and deductibles. She is often reminded of the human toll of the DeVos agenda, Whitmer said. On her birthday in late August, she was approached by a Lansing-area paraeducator while taking a rare night off from campaigning. She had stopped in a store with her family between dinner and a movie.